2017 1/4 oz Australian Gold Kangaroo Perth Mint Coin. 9999 Fine BU In Cap. 9999 Fine BU (In Capsule). We are excited to offer you this stunning 2017 1/4 oz Australian Gold Kangaroo Coin. 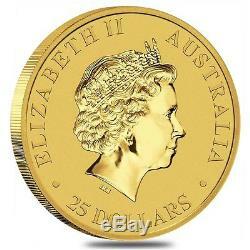 This spectacular gold coin is made from 1/4 oz. 9999 fine gold and is the latest issue in the worldwide renowned Kangaroo Series from the Perth Mint. The reverse side of the coin showcases the engraving of the newest image of the Australian kangaroo jumping across an outback plain, making this coin a treasured addition for passionate collectors of the series and a sought-after collectible. Consists of 1/4 troy oz. Perth Mint guarantees the weight and purity of the coin. Depicts the latest reverse kangaroo design. Every gold coin in our collection is 100% authentic, wrapped and packaged to be safely delivered to you in no time. 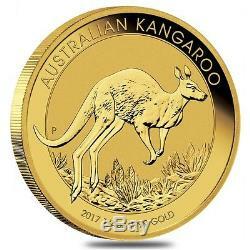 Own your 2017 1/4 oz Australian Gold Kangaroo Coin today! We do not accept American Express at this time. Please note that bullion coins, bars, and rounds are mass-produced and are not struck to the same quality standards as collector coins. These Bullion products are not certified and therefore will not always be 100% perfect. For our store FAQs page. The item "2017 1/4 oz Australian Gold Kangaroo Perth Mint Coin. 9999 Fine BU In Cap" is in sale since Friday, December 09, 2016.